Honoring New Moon in Sagittarius: New Moon is a new cycle. This new moon is aspected by Mars and Neptune which may feel a bit tough. While you may feel sensual and romantic it is also very delusional and irritable. Remember everyone is feeling a bit irritable this cycle so best to slow down, take time to ground and watch your temper and any situations that could be deceptive. It’s a good time to focus on creating and your imagination. Cost is $15. Please bring a mat or cushion. 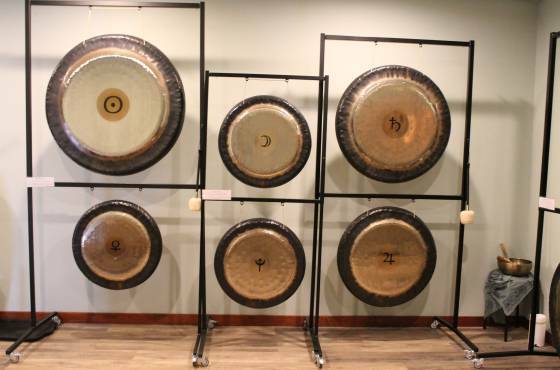 Lie or sit on the floor and allow the sounds and vibrations of the gongs to wash over you. Being bathed in the sound, allows one to relax and find a deep meditative state quickly. Please be timely. First come first serve. Payment can be cash or check at the door.